Jellyfish are interesting looking creatures. There are over 10,000 species of jellyfish. The main types of jellyfish are the box jelly fish, sea anemones, portuguese man of war and true jelly fish. Of these types, the box jellyfish is the most lethal. One sting can cause paralysis, and heart and ling failure. The next most letha is the Portuguese man-of-war. The sting can cause shock, fever, heart and respiratory failure. The most common jellyfish stings are painful but not lethal. Here is how you can treat a jellyfish sting. Vinegar should be applied to the site fo the sting as soon as possible. Pour as much as can be tolerated. The vinegar actually deactivates the nematocysts (stingers pressed underneath the skin) at the site of the jellyfish contact with the skin. The nematocysts contain jellyfish toxin and the pain is immediate and extremely intense to the victim. You can also use seawater to deactivate the nematocysts. Try to identify which species of jellyfish you came in contact with. This is important especially of you need medical attention. The Box Jellyfish is found in bodies of water in Northern Australia, Malaysia, Indonesia, Philippines, Thailand and Vietnam. The head of the Box Jellyfish is large. It is about the size of a basketball and is square shaped. The Portuguese man-of-war is found off the coast of the Atlantic, North Pacific and Indian oceans. It is shaped like an upside-down canoe. It has a distinctive ridge on its back. It may be pink or blue in color and 3 to 12 inches long. If there are any tentacles attached to the victim, remove them with care. Do not use bare hands. You need to use gloves, a stick or even tweezers. If you touch the tentacles or any other part of the jellyfish you will be sting. The area where the sting is should not be rubbed. The nematocysts that are under the skin will release more toxins into the person. The site should be kept as level with the heart as possible for a Box Jellyfish sting. If the limb is raised above the heart, the venum will reach the heart and maybe cause cardiac arrest or permanently damage the heart. If the site is moved below the heart it will swell. Seek emergency medical help immediately. 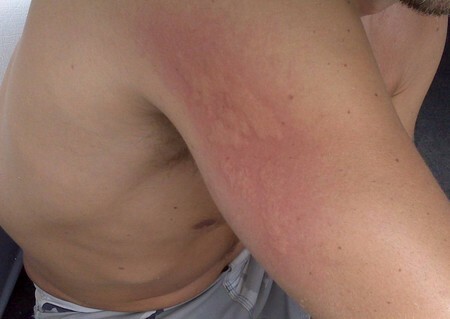 For a regular Jellyfish sting, you can offer the patient a pain killer. The pain will usually lessen over the course of a few hours. The symptoms are redness, rash, headaches, dizziness and pain. If the symptoms turn into chest pains, hyperventilation or vomiting seek medical attention immediately.